Looking for ways to connect your undergraduates in introductory courses with authentic data from the Ocean Observatories Initiative (OOI)? Then check out the OOI Data Explorations project. The OOI Data Explorations project provides a series of free online interactive data visualizations that make use of cutting-edge research datasets available from the OOI. 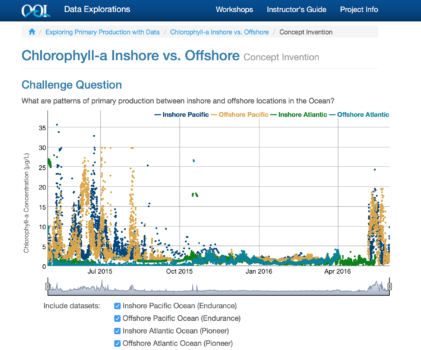 Each exploration engages students in a quick (15-20 minute) activity, using datasets that were selected to augment concepts that are commonly taught in introductory oceanography courses. You can easily integrate these data activities into your courses, ideally as in-class group activities as part of an active-learning strategy. An Instructor Guide for each exploration is also available, and explains how each activity can be used to support a specific phase of the Learning Cycle. The following Data Exploration collections were developed in 2016 and 2017 as part of a pilot project. We are currently working on plans for the development of additional Data Explorations and faculty professional development workshops for 2018. For more information or questions, please contact the OOI Data Explorations project team.